Miniaturized robots that could one day function medically inside the human body are being designed by researchers in Trieste and Catalonia. The robots of the future will be increasingly like biological organisms, with the same “softness” and flexibility as biological tissues, according to Antonio De Simone from SISSA (the International School for Advanced Studies of Trieste) and Marino Arroyo from the Polytechnic University of Catalonia, who have just published a paper in the Journal of the Mechanics and Physics of Solids, inspired by unicellular water microorganisms. “If I think of the robots of tomorrow, what comes to mind are the tentacles of an octopus or the trunk of an elephant rather than the mechanical arm of a crane or the inner workings of a watch, said De Simone. “And if I think of microrobots, I think of unicellular organisms moving in water. One of the aims of De Simone’s research — which has recently been awarded a European Research Council Advanced Grant of 1,300,000 euro — is to transfer the knowledge acquired in euglenids (unicellular microorganisms) to microrobotics. Microrobots may in fact carry out a number of important functions, for example for human health, by delivering drugs directly to where they are needed, re-­opening occluded blood vessels, or helping to close wounds, he suggests. 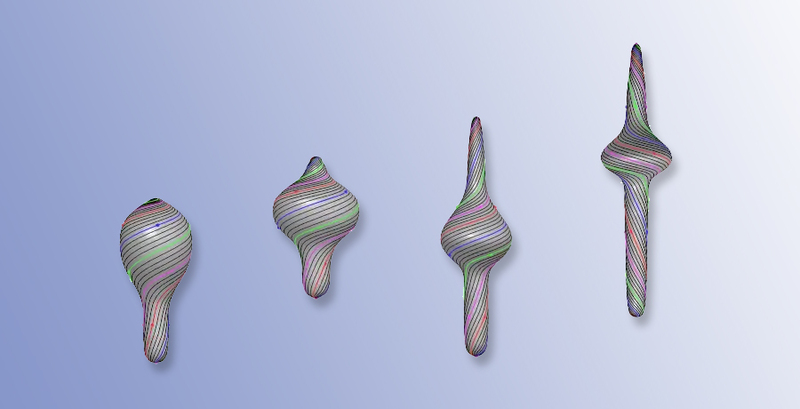 In their study, De Simone and Arroyo simulated euglenid species with different shapes and locomotion methods, based chiefly on cell body deformation and swelling, to describe in detail the mechanics and characteristics of the movements. These devices may possibly incorporate some of the features of the nanorobots (“nanobots”) conceptually designed by Robert A. Freitas, Jr.
We examine a novel mechanism for active surface morphing inspired by the cell body deformations of euglenids. Actuation is accomplished through in-plane simple shear along prescribed slip lines decorating the surface. Under general non-uniform actuation, such local deformation produces Gaussian curvature, and therefore leads to shape changes. Geometrically, a deformation that realizes the prescribed local shear is an isometric embedding. We explore the possibilities and limitations of this bio-inspired shape morphing mechanism, by first characterizing isometric embeddings under axisymmetry, understanding the limits of embeddability, and studying in detail the accessibility of surfaces of zero and constant curvature. Modeling mechanically the active surface as a non-Euclidean plate (NEP), we further examine the mechanism beyond the geometric singularities arising from embeddability, where mechanics and buckling play a decisive role. We also propose a non-axisymmetric actuation strategy to accomplish large amplitude bending and twisting motions of elongated cylindrical surfaces. Besides helping understand how euglenids delicately control their shape, our results may provide the background to engineer soft machines.